The social model of disability counters the medical model approach by suggesting disability arises, not as a result of impairment, but from barriers within ‘an oppressive and discriminating society.’21,23 The social model shifts the onus away from an individual who requires a cure to the community itself for creating barriers that constructs the disability. A perceived strength of the social model is that it is socially and politically located in activism for social change.24,25 With regards to hearing, these barriers could affect people who have any degree of hearing loss or auditory processing difficulty. Examples of barriers include poorly designed spaces with poor acoustics, reverberation, background noise, distance, and visual obstructions. Other examples include inaccessible media (no closed captioning), lack of sign language interpreters, lack of access to assistive technologies (e.g. hearing aids, hearing loop systems, FM/IR systems, sound field systems, CART, alerting systems), discriminatory work practices, and societal prejudices. The WHO International Classification of Functioning and Disability framework seen in figure one26 is a framework which aids in the conceptual basis for the definition, measurement and policy formulations for health and disability. It focuses on improving participation and function when doing an activity while addressing environmental and personal factors. Environmental factors make up the physical, social and attitudinal environment in which people live and conduct their lives. It characterizes disability as the result of a complex relationship between an individual’s health condition, their personal factors, and of the external factors that represent the circumstances in which the individual lives. Figure 1. 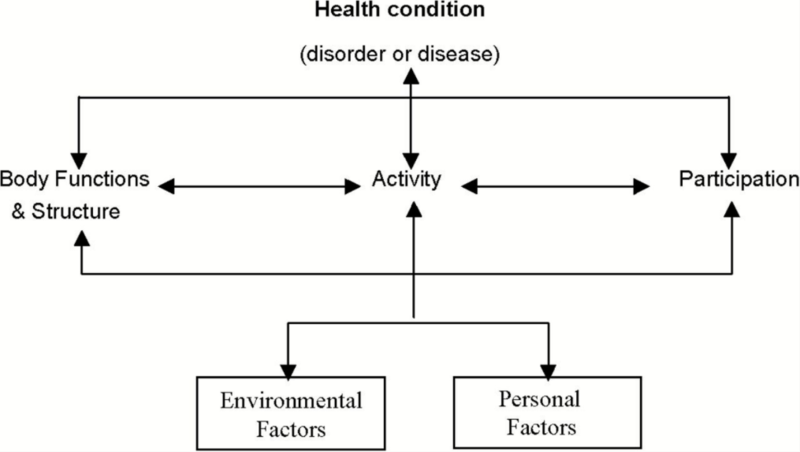 The International Classification of Functioning and Disability (ICF) framework [WHO (2001)]. Educational audiology is a good example of how the profession facilitates successful functioning by getting out of the booth and assessing the needs of a child in their school environment. According to the WHO framework of disability, hearing loss is the health condition which can affect body functions and structures (e.g., the ear), related activities (e.g., difficulty hearing teacher), and the participation of the individual (e.g., lack of peer to peer learning). By going into the classroom and exploring each student's individual educational environment and their ability to complete specific tasks within this environment, the audiologist is able to improve access to teachers, peers and other audio components of the curriculum. Audiologists can work as part of a team with government, architects, product and building designers, disability support workers and people who are Deaf/deaf and hard of hearing. This helps support businesses, educational institutions, workplaces, health care settings, and community organizations apply these universal hearing design principles to environmental barriers by focusing on both user-aware and customizable designs. This support can include consultation on policies and procedures, comprehensive site assessments examining the tasks or activities required to perform within a given environment, the demands of the activities, the resources that are available, and suggestions on how to improve function and participation. Examples of solutions other than personal amplification could include assistive devices (e.g., classroom audio distribution systems, loop systems, DM systems, IR systems, alerting devices, portable or fixed counter loop systems), reducing acoustic barriers, adapting how someone performs certain tasks, counselling, and/or educational training to reduce attitudinal and societal barriers. Using the universal design for hearing principles as a framework to ensure auditory communication needs are being met is important since solutions and technologies change over time. As part of a public health approach, these principles can also play an important role in helping communities become age-friendly. The number of Canadians living with a physical disability that impairs their mobility, vision, or hearing will rise from 2.9 million to 3.6 million over the next 13 years, nearly double the pace of the population as a whole. Real spending by this group will rise from 14 to 21% of the total consumer market. Overall, accessibility outcomes are critically affected by the way society positions and views disability. The field of audiology must move beyond the medical model and step out of the booth to better meet the needs of those they serve. One way to do this is to examine ways we can expand our role in the built environment both from a universal design perspective and in providing individual rehabilitative support. With the adoption of both Federal and Provincial accessibility legislation (Manitoba, Nova Scotia, Ontario) there is now greater support to create accessible environments in Canada.38 Creating more positions in public and private practice that extend audiology services to provide more consulting services in environments that cause barriers for people who are Deaf/deaf or hard of hearing such as workplaces, educational settings for children and adults, businesses, nursing homes and community organizations will be essential in improving accessibility. Mason A and Mason M. Psychologic impact of deafness on the child and adolescent. Prim Care 2007;34:407–26. doi: 10.1016/j.pop.2007.04.003. Kotby MN, Tawfik S, Azizm and Taha H. Public health impact of hearing impairment and disability. Folia Phoniatr Logop 2008;60:58–63. doi: 10.1159/000114646. Karchmer MA and Allen TE. The functional assessment of deaf and hard of hearing students. Am Ann Deaf 1999;144:68–77. doi: 10.1353/aad.2012.0468. Venail F, Vieu A, Artieres F, et al. Educational and employment achievements in prelingually deaf children who receive cochlear implants. Arch Otolaryngol Head Neck Surg 2010;136:366–72. doi: 10.1001/archoto.2010.31. Schroeder L, Petrou S, Kennedy C, et al.. The economic costs of congenital bilateral permanent childhood hearing impairment. Pediatrics 2006;117:1101–12. doi:10.1542/peds.2005-1335. Thomson RS, Auduong P, Miller AT, and Gurgel RK. Hearing loss as a risk factor for dementia: A systematic review. Laryngoscope Investigative Otolaryngology 2017;2(2):69–79. http://doi.org/10.1002/lio2.65. Polatajko HJ, Townsend EA, and Craik J. Canadian Model of Occupational Performance and Engagement (CMOP-E). In Enabling Occupation II: Advancing an Occupational Therapy Vision of Health, Well-being, & Justice through Occupation. EA Townsend & HJ Polatajko, Eds. Ottawa, ON: CAOT Publications ACE; 2007. Barnes C and Mercer G. Disability Volume 19 of Key Concepts. Leeds:Wiley; 2003. Jackson MA. Models of disability and human rights: informing the improvement of built environment accessibility for people with disability at neighborhood scale? Laws 2018;7:10. Campbell J, Oliver M. Disability Politics: Understanding Our Past, Changing Our Future. Abingdon: Routledge; 1996. Tremblay KL. Why is hearing loss a public health concern? Hear J 2017;14–16. 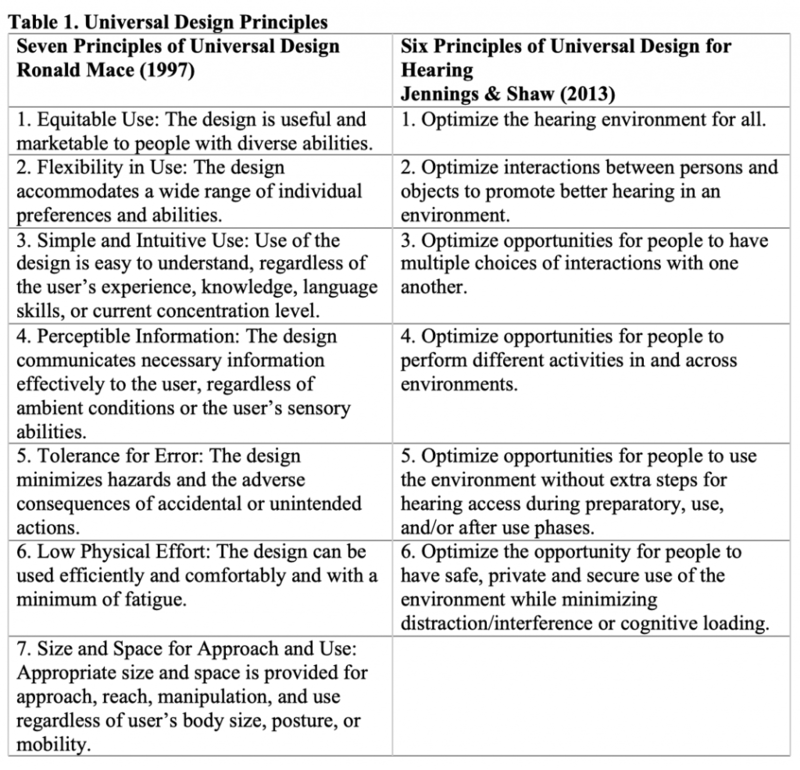 Fok D, Shaw L, Jennings MB, and Cheesman M. Universal accessibility and usability for hearing: Considerations for design. Can Acoust 2007;35:3. Jennings MB. Hearing Accessibility and Assistive Technology Use by Older Adults: Application of Universal Design Principles to Hearing. In Louise Hickson ed. Hearing Care for Adults 2009- The Challenge of Aging. (pp. 249-254). Proceedings of the Second International Adult Conference. Second International Adult Conference, Chicago, United States, 16-18 November 2009. Staefa, Switzerland: Phonak.